Michael McFadyen's Scuba Diving - SS Birchgrove Park The last real shipwreck to occur in the Sydney area was the loss of the SS Birchgrove Park on 2 August 1956. The Birchgrove Park was lost off the far northern beaches of the City in a terrible storm while on a regular trip from Newcastle to Sydney. Robert William Miller was born on Monday 27th January 1879 at South Queensferry, West Lothian, Scotland. He was the son of Robert Johnston Miller and Christina (Fraser). Like is father R. W. Miller went to sea in 1893 as a cabin boy on sailing ships. During 1895, he sailed around Cape Horn and before 1900 he had acquired his Master Mariner's Ticket. One of Miller's first contracts was to pick up overburden and spoil from the sinking of the Balmain Colliery shaft and dump it at sea. Miller saw the opportunity to sell this material and he ended up getting sixpence a ton from a local council and other contractors for use as road bases and building foundations. Following this close association on Wednesday 15th January 1913 Robert W. Miller was given the contract for coal distribution from Sydney Harbour Colliery Limited (Balmain mine). So began a long association with coal. 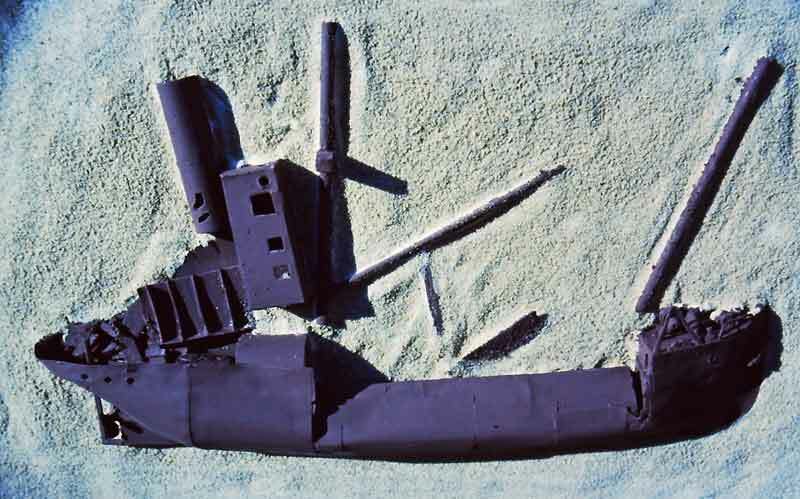 Miller built a fleet of lighters that were used to transport blue metal, sand and coal around Sydney Harbour. This introduction into coal transport opened a prospect for him to enter the larger coal shipping transport. During 1917 Miller purchased a vessel, the Audrey D in the name of his wife, Annie May Miller. The ship was used to carry coal from Newcastle to Sydney. This was a tremendous success and in mid-1918 R.W. 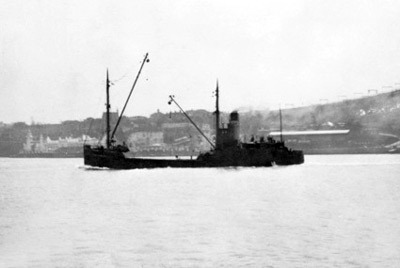 Miller acquired a second vessel, the Douglas Mawson This was sold the next year and in August 1919 the Meeinderry was purchased from Huddart-Parker Shipping Company. 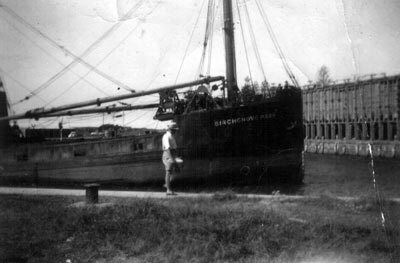 A fourth ship, the Herga was purchased in early 1921. In 1924 the SS William Macarthur (named after Miller's step-father) built by J. Lewis and Sons of Aberdeen, Scotland arrived in Australia became R.W. Miller's first carrier for his Newcastle to Melbourne coal run. In early 1924 Miller took over operations of the closed Heddon Greta Colliery. This was legalised on 24 September 1924 and the mine was renamed Ayrfield No 2 Colliery. 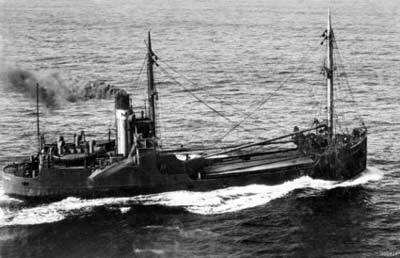 During the mid 1920s Miller's output of coal meant that additional ships were needed to transport the coal to Sydney. In 1925 SS Christina Fraser (named after Miller's mother) was built by J. Duthie Torry Steamship Company of Aberdeen, Scotland. In 1928 the SS Annie M. Miller was purchased but on 8 February 1929, less than three months after its acquisition, she sank off Sydney. This meant that R.W. Miller and Co. needed another collier. In mid-1930 when its finances were in a better state, an order was placed for a new vessel. The Birchgrove Park was a collier built by J. Lewis and Sons of Aberdeen, Scotland and launched in November 1930. The Birchgrove Park (Lloyd's Register 157592) was a collier of 640 tons and was 47 metres long and 10 metres wide. Constructed of steel and powered by a coal powered boiler and a triple expansion cylinder steam engine (producing 93 rhp - exactly the same as the Annie M. Miller's engine - it may have been identical in design) turning a single screw, the Birchgrove Park represents the end of an era, that of coal transport to Sydney by ship. Leaving the UK on 5 November 1930, the Birchgrove Park arrived in Sydney on 18 January 1931. Within two weeks she entered service, first working from Bulli but then Newcastle. At times, it seems the Birchgrove Park also carried blue metal from the quarries at Kiama. On 9 May 1941, the ship was requisitioned by the Royal Australian Navy for conversion into an auxiliary minesweeper. HMAS Birchgrove Park (FY15 - carried BP on bow) was commissioned into the Navy on 22 August 1941. Fitted with two Oerlikon heavy machine guns and a large 12 pounder gun, Birchgrove Park was then recommissioned in 1942 as a stores carrier. In August 1943 the Birchgrove Park arrived in Port Moresby and for the next two years she served various New Guinea ports. On 22 September 1945 HMAS Birchgrove Park was in Ambon (now Indonesia) with HMAS Glenlg, HMAS Westralia and others. In April 1945 the Birchgrove Park was paid off but on 25 July 1945 she was recommissioned as a tender. In December of the same year she was finally paid off and returned to R.W. Miller and Co. in February 1946. She went back to her regular Newcastle/Sydney run, although from all reports, by early 1956 her condition had deteriorated to such an extent where she was soon expected to be scrapped. However, the Sydney Morning Herald reported on 4 August 1956 that the Miller had been surveyed in July 1956 and issued with a certificate of seaworthiness. Although the last Sixty Miler did not disappear from service till mid-1993, in reality they were doomed from the late 1950s or early 1960s. Instead of having power stations in the middle of the city (eg Pyrmont, Balmain, White Bay and Bunnerong), a decision was made to replace these old dinosaurs by constructing the new super-stations on the coalfields themselves. This did away with a reason for the small colliers to ply their loads the short distance from Wollongong and Newcastle to Sydney. The other reason for transporting coal to Sydney was to replenish the bunkers of international coal-powered vessels. These had, of course, by now mostly switched over to diesel or oil powered engines. At 1.45 pm on 1 August 1956, the Birchgrove Park left Newcastle with a slight list to port. The weather was fine and sea conditions were calm. No change was predicted for more than 12 hours. However, just like now, the weather bureau was wrong and a half hour after leaving Newcastle a southerly buster hit. Waves started coming over the deck and the holds quickly took in water as the tarpaulins had worked loose. Although they were put back in place, an hour later they were again loose and more water was in the hold. The list increased and despite attention, water continued to enter the holds. The Birchgrove Park was now off Broken Bay and the winds were over 40 mph, every wave crashing over the deck. Still Captain Laurence Lynch did not seek the safety of Broken Bay. It was now midnight and water was entering the ship through a corroded steampipe and the vents on the forecastle. Soon after, the Leading Fireman, Erl Olsen, reported that the water could soon flood the boiler fires, disabling the ship. Captain Lynch ordered the crew on deck and attempted to prepare the lifeboats for launching. Due to the list, this was not successful. In addition, the ship's calls for help were never received as the aerial had not been erected before leaving Newcastle. The Birchgrove Park was still steaming on and at 2.35 am Captain Lynch asked Olsen to return to the engine room to shut down the engines. Despite the risk, Olsen successfully completed the task as Captain Lynch got an SOS away to the South Head Signal Station by lamp. At 2.45 am, the Birchgrove Park turned over and sank. The crew went into the water, clinging to the debris which came from the ship. A lifeboat was found and three crew clambered aboard. These were Erl Olsen, Charles Camilleri and Neil Stuart. Waves were crashing over the boat and Olsen and the only oar went into the ocean. Olsen managed to get back into the boat but the oar was lost. The collier William Macarthur heading north was informed of the loss and the Captain Cook set out at 3.30 am. Unfortunately, they started searching off Long Reef, almost 10 kilometres to the south of where the Birchgrove Park had gone down. Early in the morning the RAN sent three vessels, and later, a submarine, to assist in the search. Two Neptune aircraft from the RAAF were also sent to help in the search. At 6.00 am, Charles Camilleri died of exhaustion in the lifeboat and five hours later the boat was washed ashore at Lobster Bay with Olsen and Stuart still aboard. They sheltered in a shack. One of the planes sighted a number of objects in the water and dropped flares to locate each for the searching ships. HMAS Wagga responded to one flare and found Kenneth Fabian alive but in very poor condition. Two crew ended up diving in to save and assist getting him out of the water. They also found a body. About the same time, HMS Thorough, a Royal Navy submarine, rescued Joseph Butler, the last to be found alive. Five bodies were found by the Police launch Nemesis. The SS Teralba, also a Miller ship, found the body of Osborn Marsh. The last body recovered on the day of the sinking was found by a Palm Beach resident, Mr C. Gower, who was out searching in his launch Caroline H. Note that there was a report in a newspaper that a final body was found on Manly Beach at 9 am on 4 August 1956. However, this was incorrect. It appears that there may have been something sighted in the water but it was not a body. Ten crew died in the sinking, two bodies never to be found. Not found were the bodies of the Donkeyman, Alexander Robb and the First Engineer, William Gordon Sim. Butler and Fabian ended up in Sydney Hospital while Olsen and Stuart ended up in Manly Hospital. Butler and Fabian were still in hospital on 4 August 1956 while the other two were released on 3 August 1956. On 3 August 1956, two fishermen found the other lifeboat half submerged off Kilcare Beach on the Central Coast. They towed it to shore. R. W. Miller went on to own Miller's Brewery on Parramatta Road (now the orange Miller's Storage building), famous hotels such as Miller's Brighton and Coogee and the family now owns the huge Miller's Storage company. R. W. Miller died on Monday 10 February 1958 at Lewisham. 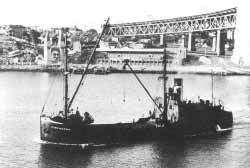 The wreck of the SS Birchgrove Park was discovered in 1965 by Wally Gibbins and Ken Bateman. Allan Power (later long-term dive operator in Vanuatu) went out with Wally within a week and took the first photographs of the wreck. Peter Harper (then doing his PhD at University of NSW and a member of the UNSW Underwater Club - died August 2016) got the marks off Wally and gave them to Chris Reilly (also from UNSWUC). In about 1969 Johnny Sumner, Tom Byron, Richard Newton and Chris Reilly decided to get the "M" off the funnel. Tom had a Bolex film camera, John had a pair of very large bolt cutters. He used these to take the "M" off the funnel. It was made of thin sheet steel. He gave it to Chris and the bolt cutters to Richard. John inflated his fenzi (a new invention in those days - a sort of primitive BCD) on the bottom because the bolt cutters weighed so much. Tom and Chris were decompressing and wondering where John was when they spotted "this orange Polaris missile like object" approaching from the bottom. John could not get the expanding air out of it without dropping the bolt cutters (or passing to Richard) and ended up going straight to the surface, where he remained. They though they had a bad case of the bends on their hands but John insisted that he often felt like that after a deep dive. John Sumner at that time owned St George Underwater Centre and a few weeks later he started running trips to the Birchgrove Park. Soon after this one of the divers died on the wreck. Peter Harper ended up a witness at the inquest. Later, Lindsay Ditchburn decided to "acquire the binnacle" by ripping it off the deck with his bare hands. He did not succeed. However, Rick Latimer later man-handled it off the wreck. He later had it on display in his house till he died. His family presumably still have it. Today, the Birchgrove Park lies on a sandy bottom of about 51 metres approximately eight kilometres south-east from Barrenjoey Headland at Broken Bay. A Global Positioning System (GPS) reading gives a latitude of 33° 38' 23"S and longitude of 151° 22' 37.8" E (note that all my GPS Readings are using AUS66 - if you use any other datum, you will need to convert the reading - see my GPS Page for more details). The attached marks will enable you to accurately find the wreck which protrudes only about four metres above the sand. Run in on the western mark till the north-western mark is seen and the wreck comes up on the depth sounder. Like most other shipwrecks I have ever dived, it is lying on its port side (I believe that this is because the ship's engine is running and once it sinks, the torque of the engine causes the ship to turn to the left). The Birchgrove Park is but a shell of her former self. 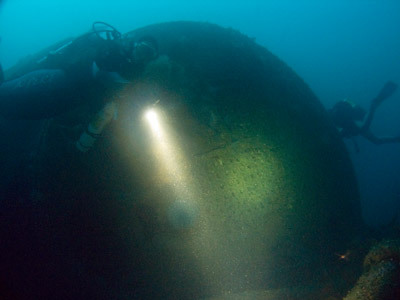 In just over 50 years the ship has suffered from the dual ravages of the weather and the scuba divers who found her only a few years after it sunk. 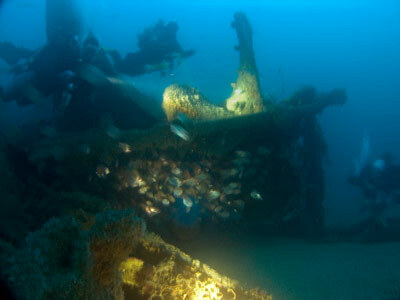 The wreck now lies on her port side facing the west, with the bow and stern fairly intact. You will probably be anchored near the boiler or engine. If you are, head towards the stern. Starting from the stern, you can look at the large prop and rudder, before swimming along the keel towards the bow. 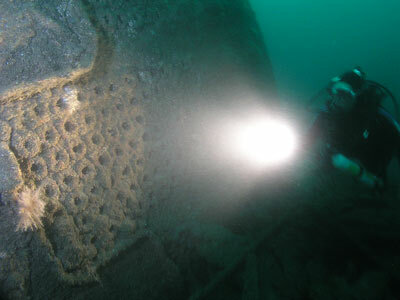 If you swim along the bottom of the hull (the northern side of the wreck), after a few minutes you will see that the hull has a large break here. Keep going and about 10 metres along a major disintegration of the hull in front of the boiler. The whole hull has come apart from the main section of the ship for the length of the boiler. 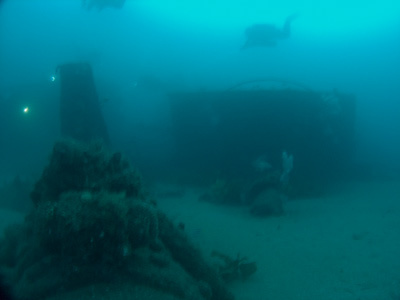 If you do not swim on the outside of the wreck, you can swim through the space between the hull (which has sort of rolled out from the ship a few metres - as mentioned earlier) and the boiler and come out in front of the boiler. There are conger and moray eels living in the boiler pipes and sometimes wobbegongs in the firebox. If you head to the south from the boiler gap, you will come out near waht was the deck area of the ship. From here back towards the stern you will see the large engine. 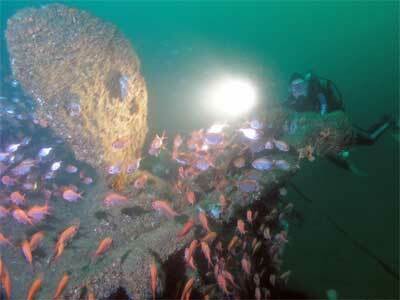 After a quick look, swim over the sand adjacent to the wreck and you will soon see the funnel. Behind the funnel on the sand is a memorial plaque to Rick Latimer, one of Australia's best known wreck divers. As of September 2005 this is unreadable as it is covered in growth and I could not even find it in July 2010. In front of the funnel the whole bridge is lying detached from the main hull. 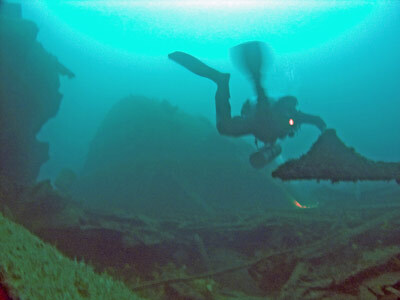 You can easily enter the bridge from the main wreck side and explore the upper and lower levels. In front of the bridge there is a very large mast lying on the sand. There is also a crane arm in front of the mast which runs from the base of the mast at about 45°. Heading towards the bow you will see another smaller mast and some other pieces of wreckage. Note that the photos of the ship prior to World War II it had a very large mast here. During the War there was only one mast compared to the two before and after the War. In this area the wreck is again split. The hull overhangs quite dramatically in the front section of the Birchgrove Park. You can swim under this area, and, with proper training, planning and equipment, you can enter some of the tighter sections. Further towards the bow you can enter the forecastle (the section under the actual bow) and exit from a number of holes. You can see the bow section has broken away from the rest of the wreck and has dropped over a bit. There are bollards visible here. From here, you can swim back over the hull to the boiler area. This should have taken about 15 minutes or so. It takes a large number of dives on the SS Birchgrove Park to fully appreciate the wreck, although one dive will give you a good overview. Despite all this damage, the Birchgrove Park is probably the most intact wreck in the Sydney area (discounting scuttled vessels) and makes a great dive for the experienced deep diver. The Birchgrove Park does not normally suffer too much from current and is generally blessed with fairly good visibility, although after prolonged periods of rain the Hawkesbury River could impact on the wreck. Only for the experienced and well-equipped deep diver. On 3 August 1996, I was among a large group of divers who dived the wreck on the 40th Anniversary. Erl Olsen was a guest at the function held afterwards at Atlantis Divers (Kenneth Fabian was also said to have been attending but I did not see him).